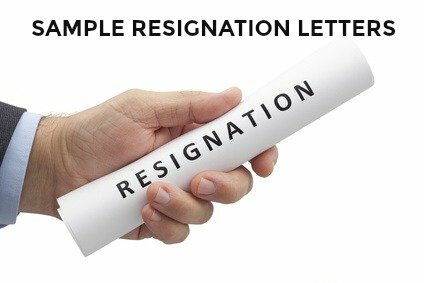 A number of free resignation letters that cover a variety of situations including resigning for a new job, leaving due to relocation or leaving your job to study. A polite and professional resignation letter ensures that you leave the company in the proper manner. Select the letter of resignation that applies to your specific situation and adapt it for your own use. Use this basic resignation letter when you do not want to discuss your reason for leaving. I have enjoyed working at The Corporation and have learned a great deal. I appreciate both the opportunities and guidance I have been given during my employment with the company. However I have decided that the time has come for me to move on and this letter serves as my formal resignation from the position of Secretary with The Corporation. In fulfillment of my employment contract I am giving you two weeks notice from today's date March 15, 2019. My last working day will be Friday March 29, 2019. I wish you and The Corporation continued success in the future. There are a number of valid reasons for leaving a job. 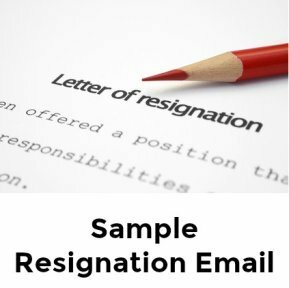 If you would like to provide a reason in your resignation letter, select from one of these resignation letter examples. Free resignation letters to use when you have accepted another position. Please accept this letter as my formal resignation as Accountant for Clean Corporation. My last working day will be (provide date after 2 weeks or required notice period). Leaving my job with Clean Corporation has been a difficult decision as my time here has been so positive and rewarding. I am grateful for all the opportunities I have been given and I have particularly enjoyed been part of your team. However after much consideration I have accepted a new career opportunity with another company. I wish you and the team continued success. Free resignation letters to use when you are relocating or leaving to study further. Regretfully, I am writing to tender my resignation as Sales Agent from Dax Technology, Inc. My last working day will be March 29, 2019. This is two weeks from today, as per my employment contract. I have enjoyed the past two years working with you and the team at Dax, however due to personal circumstances I have chosen to relocate to (City/State)/however I have decided to take the next year to study at XYZ. Thank you for the opportunities you have given me during my employment with Dax Technology and I wish you and the company continued success. Go through the how to resign checklist to understand your rights and obligations to your employer when you decide to resign. Free resignation letters - how do I write a good resignation letter? We have a number of excellent resources to help you write the perfect resignation letter. Use the free resignation letter template to structure your letter of resignation. If you want to resign via email use this resignation email sample. Are you expected to complete an exit interview before you leave? View exit interview questions and be well prepared. Make sure you obtain an employment reference from your employer before you leave the company. These references are essential to any future job search and to developing your career. These sample resignation letters are provided for guidance purposes only. Resignation letters should be edited to fit your own personal situation.